The first critical and complete edition of Charles Wesley's manuscript journal in two volumes. While remaining firmly committed to the Church of England, Charles Wesley shared in the founding of Methodism, a religious movement that has had far-reaching social and religious influence worldwide. These volumes of Charles Wesley's manuscript journal is the first complete edition. Included are all transcribed shorthand passages, words that Charles underlined, other forms of emphasis or peculiarities in Charles's script, word that Charles struck out. Any uncertain reading or transcription is indicated in the footnotes. In addition there is an annotated index of persons, places, and sermon texts in Volume II. Volume I is Wesley's manuscript journal from 1736 to 1741. Volume II is Wesley's manuscript journal from 1743 to 1756. While remaining firmly committed to the Church of England, Charles Wesley shared in the founding of Methodism, a religious movement that has had far-reaching social and religious influence worldwide. 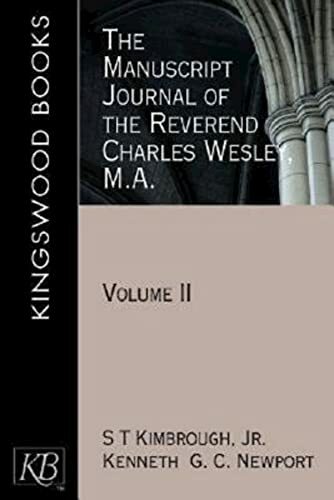 These volumes of Charles Wesley's manuscript journal is the first complete edition. Included are all transcribed shorthand passages, words that Charles underlined, other forms of emphasis or peculiarities in Charles' script, word that Charles struck out. Any uncertain reading or transcription is indicated in the footnotes. In addition there is an annotated index of persons, places, and sermon texts in Volume II. Volume I is Wesley's manuscript journal from 1736 to 1741. Volume II is Wesley's manuscript journal from 1743 to 1756.